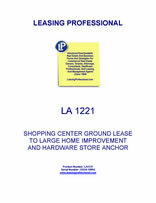 This ground lease is designed for an anchor tenant in a shopping center which sells home improvement products. The tenant's store will be built on a pad within the center, but the tenant is not obligated to pay percentage rent. The tenant is subject to an opening covenant, and an operating covenant, but their terms are far more relaxed than those found in leases for smaller "shop" tenants. (b) Upon the date Tenant actually commences to do business in, upon or from the Premises. Landlord shall deliver possession of the Pad to Tenant when all of the conditions to Landlord's performance under this Lease have been satisfied or waived. If Landlord is delayed in the delivery of possession of the Pad to Tenant for any reason other than Tenant-caused delays (in which event there shall be no change in the Commencement Date), the "Commencement Date" shall be adjusted, accordingly. Notwithstanding anything in this Lease expressed or implied to the contrary, the Construction Exhibit attached as Exhibit "C" to this Lease shall be in full force and effect as of the Execution Date of this Lease. 2.2 Supplemental Agreement. When the Commencement Date is not specified in Paragraph 7 of the Lease Summary and, as a consequence, has been determined as hereinabove set forth, then, within five (5) days after Tenant's receipt of Landlord's written request therefor, Tenant agrees to execute a Supplemental Agreement in the form attached hereto as Exhibit "F," to become a part hereof, setting forth the Commencement Date and the expiration date and the date by which Tenant must give Landlord notice of intent to exercise an extension option. 2.3 Improvement Work. Landlord shall at its sole cost and expense, promptly and diligently perform and complete all site preparation and Site Improvements duties that are Landlord's responsibilities under and in accordance with Exhibit "C" and shall deliver possession of the Pad to Tenant substantially in accordance with the terms of Paragraphs 2.1(a) and Exhibit "C". Any construction and/or installation of Tenant's Improvements, fixturization or other work on the Premises that is to be performed by Tenant shall be the sole responsibility of Tenant. 2.4 Landlord's Failure to Complete. Notwithstanding anything to the contrary herein, should Landlord fail to deliver possession of the Pad substantially in accordance with the terms of Exhibit "C" by June 1, ____, this Lease shall then be voidable, at the option of Tenant, upon ten (10) days written notice to Landlord, provided that Tenant gives such notice by ____________. If the work required to be performed by Landlord pursuant to Exhibit "C," if any, in order to deliver possession of the Pad to Tenant, depends in whole or in part upon work to be performed in connection therewith by Tenant, then the Pad shall be deemed to have been delivered to Tenant on the date that the Pad would have been delivered if Tenant had performed the work required of Tenant in a diligent and timely manner and in accordance with the schedule for the performance of said work established by Landlord's project architect. The reasonable determination by Landlord's project architect as to the date possession of the Pad is delivered to Tenant in accordance with the terms of Paragraph 2.1(a), taking into consideration delays, if any, caused by Tenant, as aforesaid, shall be conclusive upon the parties hereto. If through no fault of Landlord, Landlord fails to deliver possession of the Pad within one (1) year after the Execution Date (and Tenant has not otherwise canceled this Lease as provided in this Paragraph 2.4), either Landlord or Tenant may cancel this Lease. In the event of any such termination, neither party shall have any liability or obligation whatsoever to the other, except for any obligations hereunder that expressly survive termination and that any deposit by Tenant shall promptly be refunded, without interest, by Landlord. 2.5 Opening of Tenant's Premises. Promptly after delivery of possession of the Pad, Tenant agrees to, at its sole cost and expense, (i) perform all of Tenant's work set forth in Exhibit "C"; (ii) equip the Building with new trade fixtures and all new personal property necessary or proper for the operation of Tenant's business; and (iii) open for business as a ______________ store. If Tenant fails to comply with its obligations under this Paragraph 2.5, Landlord may, in addition to and without limiting any other remedies available at law or in equity, terminate this lease. 2.6 Lease Year. The term "Lease Year" shall refer to each successive twelve (12) month period following the Commencement Date. 2.7 Options To Extend Term. Landlord hereby grants to Tenant the right to extend the term of this Lease (the "Extension Option") for one (1) additional term of ten (10) years followed by two (2) additional success terms of five (5) years each by giving Landlord written notice of its intention to do so in each instance at least one (1) year (but not more than two years) prior to the expiration of the then-current term. The term as so extended shall be upon the same terms and conditions as set forth in this Lease, except that the Fixed Rent during the extended term shall be determined in the manner provided in Paragraph 3.2, below. Should Tenant in any instance fail to give timely written notice of its intention to exercise its option to extend the term, Tenant shall be deemed to have elected not to exercise its said right to extend the term, and this Lease shall expire in accordance with its terms. Time is of the essence with respect to the requirement that Tenant give timely notice of its election to exercise its right to extend the term, and Tenant's failure timely to exercise any option shall constitute a material, irredeemable and incurable failure to satisfy a condition precedent to the vesting of such right, and Tenant hereby expressly waives any right to claim relief from forfeiture, or any other equitable relief, from the consequences of any untimely exercise of its right to extend the term of this Lease. The implied covenant of good faith and fair dealing under this Lease shall not be construed to impose upon Landlord any obligation to notify Tenant in advance of the impending deadline for the exercise of any option, nor shall it obligate Landlord to excuse the tardy exercise of any option, however slight. Notwithstanding anything to the contrary set forth above, Tenant shall not have the right to exercise any option to extend the term of this Lease (i) during the time commencing from the date Landlord gives Tenant a written notice that Tenant is in default under any material provision of this Lease and continuing until the default described in said notice is cured, (ii) during the period of time commencing on the day after a monetary obligation to Landlord is due from Tenant and unpaid and continuing until the obligation is paid, or (iii) as to the second and third Extension Options, if the prior options were not timely exercised. The period of time within which any option may be exercised shall not be extended or enlarged by reason of tenant's inability to exercise such option prior to satisfaction of the foregoing conditions precedent. The Extension Option may not be exercised or assigned involuntarily by or to any person or entity other than Tenant except as provided in Article 17, nor shall the Extension Option be assignable apart from this Lease. 3.1 Payment. From and after the Commencement Date during the Term of this Lease, Tenant shall pay to Landlord, at the address in the Lease Summary or such other address as Landlord designates in writing, the fixed rent, as set out in Paragraph 4 of the Lease Summary and adjusted pursuant to Paragraph 3.2, below (the "Fixed Rent"), on the first day of each month, in advance. If the Commencement Date occurs on a day other than the first day of a month, then the Fixed Rent for the fraction of the month starting with the Commencement Date shall be paid on the Commencement Date, prorated on the basis of the actual number of days in such month. If the term hereof ends on a day other than the last day of a month, then the Fixed Rent for the month during which the expiration occurs shall be prorated on the basis of the actual number of days in such month. In addition to the Fixed Rent, Tenant agrees to pay "Common Areas Operating Costs" (as described in Paragraph 4.1, below). The Fixed Rent, Common Areas Operating Costs, Landlord's Taxes and any other monetary obligations due Landlord under the Lease are hereinafter referred to collectively as the "Rent." The Rent shall be payable to Landlord, in lawful money of the United States of America, in currently available funds at the address for Landlord set forth in the Lease Summary (or to such other person or at such other place as Landlord may from time to time designate writing), without notice, demand, offset, deduction or setoff. In no event shall the Rent be reduced by any other provision of this Lease for sums payable by Landlord. "Force Majeure" (as defined in Exhibit "C") shall be deemed to impact the Commencement Date under this Lease. 3.2 Cost of Living Adjustment. The Fixed Rent payable for each Lease Year, including during the Extension Options, shall be increased every five (5) years during the term of this Lease, including the option terms, by the product of (a) 2.50, multiplied by (b) the percentage increases, if any, in the Consumer Price Index-All Urban Consumers (Los Angeles-Anaheim-Riverside Area; Base: 1982-84=100) (the "Index") as published by the United States Department of Labor, Bureau of Labor Statistics (the "Bureau"). Notwithstanding the foregoing, with respect to each five (5) year period of this Lease term, including the Extension Options, in no event shall the percentage increase in the Fixed Rent exceed a cumulative increase of ten percent (10%) from the prior five (5) year period. For example, the Fixed Rent for the second five (5) years shall not exceed $______________ per year. The Index for the calendar month preceding the first calendar month of each Lease Year in which an adjustment in the Fixed Rent is required, as aforesaid, shall be compared with the Index for the calendar month sixty (60) months earlier, and Fixed Rent shall be increased in accordance with the percentage increase, if any, between such two (2) monthly indexes. In no event shall Fixed Rent be decreased. Landlord shall calculate and give Tenant written notice of any such increase in Fixed Rent, and the same shall be due and payable by Tenant, retroactively, as of the first day of the Lease Year in which the adjustment went into effect. Pending the calculation of the increase of Fixed Rent as provided herein, Tenant shall continue to pay the same Fixed Rent which it had been paying during the immediately preceding period and shall promptly pay the deficiencies, if any, upon demand therefor by Landlord. No delay or failure by Landlord to enforce this provision or any part thereof as to Tenant, or to enforce similar or dissimilar provisions in other leases in use as to any other tenants in the Shopping Center, shall be deemed to be a waiver hereof, or prevent any subsequent or other enforcement hereof. If the Bureau shall change the base reference period from 1982-84=100 or otherwise changes its method of computing the Index, the successor Index so published shall be used by applying an appropriate conversion formula or table as may be supplied by the Bureau. If the region covered by the Index is changed, the renamed local Index covering the region in which the Shopping Center is located shall be used. If the publication frequency is changed, so that a monthly Index is not available to make a cost of living adjustment in the Fixed Rent as specified herein, the increase shall be based on the percentage difference between the Index for the closest preceding calendar month prior to the Commencement Date for which a monthly Index figure was available. Should the Bureau discontinue the publication of the Index, or publish the same less frequently, or alter the same in some other manner, Landlord, in its reasonable discretion, shall adopt a substitute Index or procedure which reflects and monitors consumer prices. Tenant shall promptly pay the deficiencies, if any, upon demand therefor by Landlord. 4.1 Common Areas Operating Costs; Definitions. (xiv) any other expenses or charges of whatsoever kind, whether or not hereinabove described, which, in accordance with generally accepted accounting or management principles, would be considered an expense of operating, maintaining, repairing and periodically replacing any part or portion of the Common Areas and/or Associated Personal Property located or used in the Common Areas, plus ten percent (10%) of all of said costs to cover Landlord's administrative and overhead costs, and to compensate Landlord for supervision of the operation, maintenance, and repair and periodic replacement of any part or portion of the Common Areas. Said ten percent (10%) of costs shall be reduced by amounts paid by Landlord to a management company performing some or all of the management of the Common Areas. The ten percent (10%) shall not be applied to Common Areas insurance premiums, Common Areas real property taxes, Common Areas capital expenditures, or any third party management fees or other costs associated with third party management of the Shopping Center. (c) The term "Estimated Common Areas Operating Costs" shall mean the monthly estimates of Tenant's Proportionate Share of Common Areas Operating Costs for each Lease Year to be given by Landlord to Tenant pursuant to the terms hereof. (d) The term "Landlord's Taxes" shall mean and include all real and personal property taxes, charges and assessments, water and sewer rents and taxes on parking of any description, which are levied, assessed upon or imposed by any governmental authority of every kind and nature whatsoever, general and special, during any Fiscal Year with respect to the Common Areas and all improvements thereon, fixtures and equipment and all other property of Landlord, real or personal, located in the Shopping Center and used in connection with the operation, maintenance, repair and periodic replacement of any part or portion of the Common Areas (computed as if paid in permitted installments regardless of whether actually so paid), and any tax which shall be levied or assessed to or in lieu of such real or personal property taxes (including without limitation, any value added tax or municipal income tax), and any license fees, commercial rental tax or other tax upon rents, the entering into of leases, or Landlord's business of leasing or operating the Shopping Center, including all costs and fees (including reasonable attorneys' fees) incurred by Landlord in contesting taxes, assessments and/or negotiating with the public authorities as to same; provided, however, that the term "Landlord's Taxes" shall not include any federal, state, or local income tax, or any franchise, estate or inheritance taxes. The term "Landlord's Taxes" shall also include any tax, fee, levy, assessment or charge (i) in substitution, partially or totally, of any tax previously included within the definition of Landlord's Taxes, or (ii) which is imposed for a service or right not charged prior to ___________, or, if previously charged, has been increased since ___________, or (iii) which is imposed as a result of a transfer, either partial or total, of Landlord's interest in the Shopping Center or any part thereof or which is added to a tax or charge hereinbefore included within the definition of Landlord's Taxes by reason of such transfer (provided that this subclause (iii) is mean to apply to increases in property taxes resulting from any such transfer, but not to the imposition of any documentary transfer tax which may be assessed upon such transfer), or (iv) which is imposed by reason of this transaction, any modifications or changes hereto, any transfer hereof, or any Modification of the Common Areas or any portion thereof. 4.2 Payment of Tenant's Proportionate Share. Tenant shall pay Tenant's Proportionate Share of the Common Areas Operating Costs as set forth in Paragraph 9 of the Lease Summary. Tenant shall pay to Landlord, in advance, on the first day of each calendar month commencing on the Commencement Date, an amount estimated by Landlord, from time to time, as being one-twelfth (1/12) of Tenant's Proportionate Share for such Fiscal Year. Thereafter, within sixty (60) days after the end of each Fiscal Year, Landlord shall deliver to Tenant a written statement setting forth the amount of Tenant's Proportionate Share of the actual Common Areas Operating Costs for such Fiscal Year. If the aggregate payments made by Tenant for any such Fiscal Year exceed the amount of Tenant's Proportionate Share for such Fiscal Year, such excess shall be applied as a credit against future payments to be made by Tenant under this Paragraph. If the aggregate payments made by Tenant for any such Fiscal Year are less than the amount of Tenant's Proportionate Share for such Fiscal Year, Tenant shall, immediately upon demand therefor, pay Landlord the amount of any such deficiency. Notwithstanding the foregoing, subsequent adjustments may be made by Landlord as a result of information not available or expenses not determined or determinable at the time any particular adjustment is made. In the event that the Commencement Date is other than the first day of a full calendar month, the first monthly payment shall be a pro rata amount of a full monthly contribution. In the event that this Lease should end on any date other than the last day of a Fiscal Year, Tenant's Proportionate Share shall be adjusted on the basis of the ratio which the number of days which have elapsed from the commencement of the said Fiscal Year to the later of the date on which this Lease terminates or Tenant otherwise surrenders possession of the Premises bears to 365. Tenant's obligation to pay Tenant's Proportionate share shall survive termination or earlier expiration of this Lease. The term "Tenant's Proportionate Share" is subject to adjustment from time to time, and Landlord expressly reserves the right to adjust Tenant's Proportionate Share as is necessary to conform as-built square footage, to reflect changes in the size of the Shopping Center subject to Common Areas Operating Costs, or to reasonably operate the Shopping Center. Tenant's Proportionate Share is the ratio, stated as a percentage, which the number of square feet in Tenant's "Pad" (as defined in Paragraph 3 of the Lease Summary and shown on Exhibit D and as may be adjusted by verification subsequent to the completion of construction), bears to the total number of square feet of building pads subject to Common Areas Operating Costs. Should the gross leasable area of the Shopping Center ever vary from what it is as of the Commencement Date, Tenant's Proportionate Share shall be adjusted so it is the ratio, stated as a percentage, which the number of square feet in the Tenant's Pad bears to the total number of square feet in all building pads in the Shopping Center then subject to Common Areas Operating Costs. 4.3 Landlord's Records. Landlord shall keep and maintain customary records of all expenses incurred in connection with the operation, maintenance, repair and periodic replacement of any part or portion of the improvements in the Common Areas, and the same shall, upon at least ten (10) day's written notice, be made available for inspection by Tenant at Tenant's expense during regular business hours at the offices of Landlord, provided that such inspection shall not occur more than once during any twelve (12) month period. If Tenant does not dispute the same in writing within one (1) year of receiving the annual written statement setting forth the amount of Tenant's Proportionate Share of the actual Common Areas Operating Costs for such Fiscal Year, Tenant shall have irrevocably waived its right to dispute such determination or calculation.